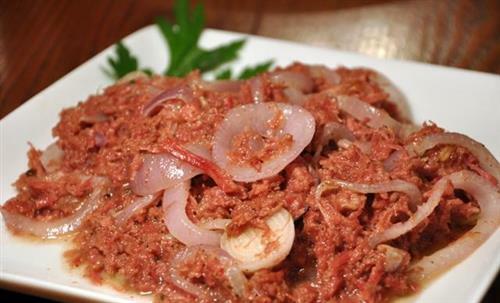 Bully Beef (aka Corned Beef) is a classic, simple and affordable dish in many Caribbean households. Its diverse quality of being able to satisfy the breakfast, lunch, snack and dinner cravings, makes it one of those "Jack of All Trade" dishes. Folks always say "once you have bully beef in your house, you will never go hungry." Heat JCS Coconut Oil in a heavy bottomed frying pan (skillet) over medium heat. Add onions, garlic (optional) and scotch bonnet to frying pan. Sauté for a few minutes until onions become translucent. Add thyme and JCS Corned Beef. Turn down heat to medium-low and stir until cooked. Add chopped tomatoes, dscallions, and JCS Browning (optional), stir well and cook for another 3 minutes. Use paper towels to absorb the extra coconut oil, if any.